Have you ever walked into a home for sale and looked down to see stained carpet or scratched and worn flooring? If so, you would probably agree that it doesn’t leave a positive first impression. Imagine if you were a buyer looking at the same floor. The right type of flooring and whether it is well taken care of can make a big difference to buyers. If your floor is questionably clean, here are a few fixes to help remedy the issue to help your home sell quickly. You’re in luck. 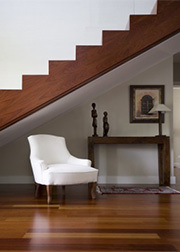 Buyers love hardwood floors and some will pay extra to get them. If your hardwood floors are covered by carpet, painted over or showing anything but the natural wood grain, it’s time for an overhaul. With the ability to rent large sanders and other tools, you can either refinish the hardwood floor yourself or hire a professional. Remember, however, that hardwood floors in have a tendency to show off scratches, dents and uneven surfaces. If you don’t think you can do an adequate job, hire a professional. Does your home have carpeting? If you don’t have hardwood floors, take a look at your carpeting. If it’s stained, outdated or ragged, it might be time to pull it up and replace it. There are many new techniques with carpet cleaning and spot repair, so check with a local carpet cleaning professional to assess your carpet before making expensive decisions. When laying the new carpet, use high-quality carpet padding to make it comfortable to stand on. Many buyers will kneel down and touch the floor, so make sure the carpet feels soft to the touch. Does your home have tile floors? Although tiles are beautiful, they typically show every ounce of old grime, dirt, chips and cracks. Go through your home and replace any that are chipped, cracked or show significant signs of wear and tear. Make sure the grout is clean and new looking, and use specialized tile cleaners or a steam cleaner to get rid of any stains. Beautiful floors can go a long way toward selling homes. Take an honest look at yours. It might just help get your home sold more quickly and at a higher price. As always, seeking the advice of a licensed real estate professional would be an excellent next step to plan your home selling preparations. This entry was posted on April 17, 2013 at 5:45 am and is filed under Around The Home. You can follow any responses to this entry through the RSS 2.0 feed. You can leave a response, or trackback from your own site.